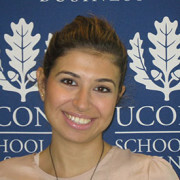 Selcan Kara is a doctoral candidate in Marketing Department at the University of Connecticut. Selcan Kara’s research broadly explores consumer behavior towards branding on two aspects, cognitive and relational; specifically, focuses on number processing, cross-linguistic variations in number processing, brand and interpersonal relationships, and self-concept related brand consumption. Because some part of her dissertation focuses on the effect of language on consumers’ number cognition that influences alphanumeric brand evaluations, Selcan received the CIBER International Business Dissertation Scholarship in 2015. Kara, Selcan, Kunter Gunasti, and William T. Ross Jr. (2015), ““Alpha” and “Numeric” in Alphanumeric Brand Names,” under review at Journal of Brand Management. Gunasti, Kunter, Selcan Kara, William T. Ross, Jr., and Rod Duclos (2015), “What Does Your Brand “State” to You? : An Exploratory Examination of How Language Affects Comparison of Alphanumeric Brand Names” under review at Journal of Marketing Research. Kara, Selcan, William T. Ross Jr., and Kunter Gunasti (2015), “What Does Your Brand Suggest to You?,” data collection complete; manuscript being prepared for submission to Journal of Consumer Research (anticipated in July 2015). Gunasti, Kunter, Selcan Kara, William T. Ross, Jr., and Rod Duclos, (2015), “An Exploration of the Process and Variations for the Effect of Language on Processing of Numbers in Alphanumeric Brand Names,” anticipated further data collection September 2015.